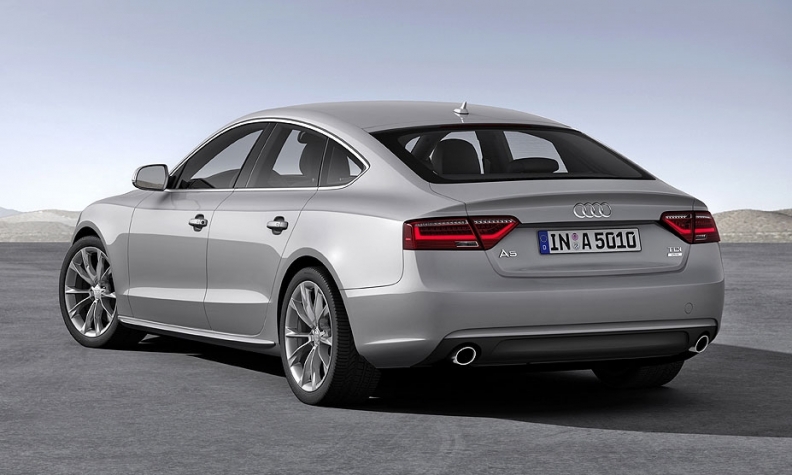 Audi readies A5 Sportback for U.S.
Coming soon to U.S. shores: Audi's A5 Sportback. SAN DIEGO -- Audi is readying plans to sell the four-door A5 Sportback in the U.S. next year, giving the luxury brand a smaller counterpart to its rakish A7. Without mentioning the Sportback by name, Audi of America President Scott Keogh said the company will add a new A5 body style in the second quarter of next year for the nameplate’s redesign. The four-door Sportback variant of the A5 is the only variant that hasn’t been sold in the U.S., where it’s available as a coupe or convertible. Keogh didn’t provide powertrain details for the redesigned A5 lineup, but expect volume models of the car to use the reworked, 252-hp turbocharged 2.0-liter four-cylinder powering the redesigned A4 that arrives this spring. Launching the A5 Sportback will give Audi a smaller counterpart to the A7, the A6-based four-door sedan with coupelike styling that has generated U.S. sales of more than 7,800 a year, on average, since it was introduced in 2011. It will also give Audi a head-to-head competitor to the BMW 3-series Gran Turismo.